According to Jared Diamond in the 2008 New Yorker article "Vengeance Is Ours," "the thirst for vengeance is among the strongest of human emotions." Whether one agrees or not, clearly history shows how important vengeance has been as a source of strife,murder, and even war. It is almost unheard of in nature. We accept lightly the notion of hunting for sport and see ourselves as behaving in a natural way, just like other species-just like other apex predators. Yet lions and gazelles are happy to share the grass around a water hole, as long as the lion is not hungry. The big cats do not attack humans unprovoked, unless the cats are ill, old, or incapacitated in some other way. Some leopards even seem to have an affinity for humans and "tame" easily, something we have taken advantage of to create the house cat, one of our only benign domestication gestures. Nobody would deny that we kill the big cats in enormous numbers, compared with how often they kill us. But there is some dispute as to how much killer instinct these animals actually have, and toward whom it is directed. Domestic cats definitely seem closer to their wild counterpart than dogs do to wolves. I never ever feel threatened by Benjy, my yellow Lab. But my cats sometimes give me a peculiar look, and I know better than to try to force them to do something they would rather not. No leashes for them. No raised voice. No commands, not even "no." Cats demand a certain distance that Benjy and others of his kind do not. They feel and give love for sure, but at the time and place of their choosing, not necessarily ours. That is why I always feel so privileged when one of my four cats decides to spend the night next to me in bed. We take for granted that dogs want to sleep next to us. In his book "The Tiger: A True Story of Vengeance and Survival," John Vaillant tells how in 1997, deep in the remote Russian backcountry, a poacher named Markov wounded a gigantic Amur or Siberian tiger. The tiger discovered the man's cabin and dragged a mattress out of his shack so he could lie comfortably in wait until the woodsman returned home. A few days later, the woodsman's horrified friends discovered remains "so small and so few they could have fit in a shirt pocket." Vaillant notes, "In general, animals (including tigers) avoid conflicts whenever possible because fighting hurts, and the margins in the wild are simply too tight. Most predators-leopards or solitary wolves, for example-will abandon a contested kill rather than risk an injury." I agree, but Vaillant believes that at least the male Amur tiger can be vindictive. He claims, "Amur tigers will occasionally kill bears solely on something that we might recognize as principle." I have never known any other animal, besides humans, to kill just on principle-that is, because the other belongs to a different species. We don't think of animals, even tigers, as capable of revenge. Animals we keep in captivity, of course, such as orcas and elephants, do feel vengeful toward us, and sometimes kill us. But in the case of this particular tiger, he really wanted to hunt down the man who tried to kill him. How human. But while tigers kill humans, we would not normally say they prey on us. In the Sundarbans of Bangladesh, 100 to 150 people are killed every year by tigers; in the rest of the world humans are not really part of their diet and tigers avoid us. The reason for the disparity seems to have something to do with tradition. Culture, if you like: tigers see other tigers kill and eat humans and they imitate them. But the comment by Jim Corbett, who was once a lion and tiger hunter, still stands many years later: "A man-eating tiger is a tiger that has been compelled through stress of circumstances beyond its control, to adopt a diet that is alien to it. The stress of circumstances is, in nine cases out of ten, wounds, and in the tenth, old age." 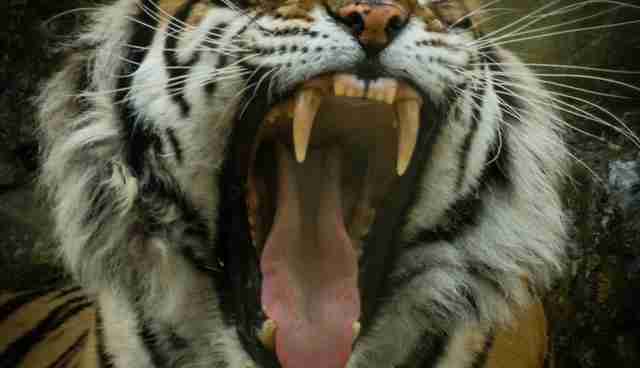 Man-eating tigers almost always carry old wounds, often the result of being shot by hunters. Isn't it logical to think the tigers knew they had human predators, and fought back? Tigers killing humans is more or less unknown in Myanmar, Thailand, Malaysia, and Sumatra. In most places on the Indian subcontinent, tigers do not kill humans. While we may never entirely understand the reason for the high number of humans killed in the Sundarbans, a successful and remarkably inventive method has been discovered to help end the killings. Since it is known that tigers attack from behind,not face-to-face, the area's 8,000 honey collectors were outfitted with rubber face masks to wear on the back of their heads. The next year, not one person wearing the mask was killed, but 29 people who temporarily removed the masks were. What this shows is that the tigers are merely opportunists.Emotions just do not enter into the picture. If the tigers are convinced they are seen, they do not attempt to kill. The reason has to do with safety: no tiger wishes to engage in risky behavior if he or she might get hurt in the process. If lions and tigers rarely kill humans, what about the big cats killing one another? In a book considered the most thorough study of African leopards ever done, Theodore Bailey writes: "Fighting among leopards was rare . . . Actual fighting among highly specialized carnivores is not advantageous to their physical well being and survival." While fighting is uncommon, it has been observed from time to time: "Fights are usually of brief duration and fights seldom result in the death of either of the combatants. Apparently most fights between males occur when one male is attempting to establish himself in an area already occupied by a resident male." The most elaborate study of lions remains respected naturalist George Schaller's "The Serengeti Lion," in which there is a description of six lions killed by other lions. Schaller mentions two other authors who also describe instances of lions killing each other. A weird thing about lions is that sometimes the male will chase away females to make certain that cubs eat; at other times, the cubs can actually starve as the adults prevent them from eating after a kill. The Oxford Encyclopedia of Mammals acknowledges this behavior, but the editor also points out: "These ‘Maneaters of Tsavo' were themselves the victims of human activity, for just a few years earlier Europeans had inadvertently imported a cattle virus that decimated wild ungulates as well as livestock, leaving little for the lions to eat." "Of 23 male and female lions 2 years old and older, resident in the Masai and Seronera prides in June 1966, one male was killed in a fight, another male probably died of wounds incurred in a fight,one female died of old age, a second one, also old, was last seen in poor condition and unquestionably died, and a third female suddenly disappeared with one of her two cubs and possibly was killed by other lions. At the end of 1969 eighteen of the original members were left." In other words, 5.5 percent per year were killed, and Schaller did not see a single instance of a female killed by a male. I think that lions are so well endowed with weapons in their claws that even if they do not intend to kill, a wound can end up killing. 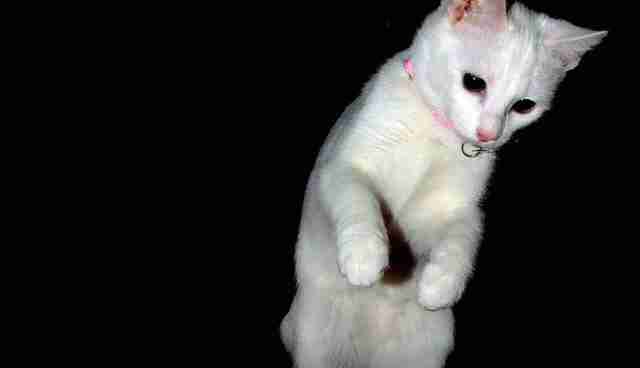 I see this in my domestic cats: they can be dangerous because they have such sharp claws and are often bad-tempered. But they definitely intend to scare, not to kill. Meghala will sit on my lap, contentedly purring, until I do something he does not like.Then he does not hesitate to sink his claws into me, even to the point of drawing blood. He doesn't seem to feel bad about it at all, even if I do. Pouncing cat, by Nic Redhead. 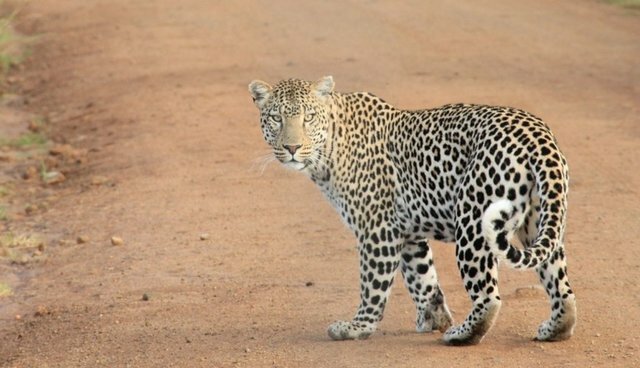 We may well wonder why the big cats tend to be bad-tempered. Here is one of those negative emotions that we can, for a change, apply to other animals besides humans. I once tried to make the case that we almost never use the term "sweet-natured" to refer to an adult human male, though we use it frequently for adult male dogs. But "bad-tempered" appears relevant to both adult human males and adult male big cats. I am beginning to think that the problem with lions is that they are equipped by nature with such lethal tools for one purpose that it is almost impossible not to use them for others. It is like giving a human a machine gun. It goes to his head. The cats who live with us in our homes tolerate us to an unusual degree for a wild animal. I say wild, because cats remain, to some extent, not entirely domesticated. We can safely say that their behavior is almost identical to that of their wild cousins, the big cats from whom they descend. Not only do they tolerate us, they often seem to like us to an inordinate degree. 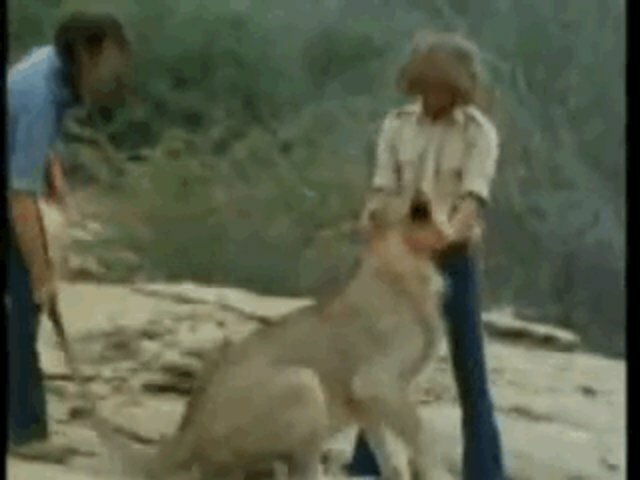 I need only point you to the incredible story of Christian the lion and the phenomenal popularity of the video where in his incarnation as a wild lion once again, he meets up with his two previous human companions. That said, when I first watched the video, I had my heart in my mouth. Here is why: Almost all cats I know will only tolerate you rubbing their tummy to a limited degree. If you go too far, or even if they have just had enough, or if their instincts are aroused, you may well find that your hand is now a prisoner: four paws, with claws out, are holding it. You may try to withdraw it only to find that the more you do so, the deeper the claws go into your hand. You look at your cat with incredulity: "See here, Meghala, it's me, you idiot!" What is he doing? Just being a felid. I have awakened a hunting maneuver in an obligate carnivore. I should have thought of that before. Meghala is only five pounds. The average size of a male lion is four hundred pounds. If Meghala jumped up on me with his claws out, I would be alarmed. If he weighed four hundred pounds, I'd be toast. I don't think Meghala intends to harm me. I am sure he does not. Like other cats, after I speak to him soothingly and remind him who I am and where he is (in a house, not in the jungle), he slowly,if somewhat reluctantly, relinquishes his hold on me and lets me go, to live another day. Because of my experience with tiny felines, I was very moved by the story of Christian the lion. Ace Bourke and John Rendall were young Australians in London when they bought a young lion fromHarrods department store in 1969. They took him on day trips to the seashore and were something of a major street attraction every time they went out on the town for a walk. When Christian was a year old and growing larger, they realized a lion could never be happy in London and got in touch with the Kenyan conservationist Geore Adams on (of "Born Free" fame). George took Christian to the Kora National Reserve in Kenya. There he became the head of a lion pride in the wild. In 1972 Ace and John decided they wanted to visit this site and see if they could locate their old friend. They traveled to Kenya, and a photographer was present when they found their former companion.It is an inspiring if terrifying moment. The film shows the lion cautiously approach his two old friends. Then suddenly he realizes who they are, and he leaps up joyfully, wrapping his huge front legs around their shoulders and nuzzling their faces in the excitement of his recognition. He is profoundly happy to see them, of that there can be no doubt. It's incredibly moving to see Christian the lion lunge at his friends Ace and John with pure joy in his heart, a full year after he was released in the African savannah. EvidentlyChristian-who had, after all, been a tame lion at one point in his life-was able to convince his female companions, Mona and Lisa,who were not tame at all, to indulge his human friends as well,permitting them to visit and stroke their cubs, one of whom, Supercub, welcomed the two men as well. We are simply not accustomed to seeing a fully wild animal express friendship and love for a member of another species, and one who is a predator, even a predator of his species. It defies our sense of ourselves: we should be the only animal capable of this feat. Yet (of course) we are not. With an animal as formidably armed by nature as any of the great cats, it may well be that they do not mean to kill you, it's a case of involuntary manslaughter. They lack intent, but you are in the way. I would suggest this is true of intraspecies violence as well:lions just want to drive other lions away. In "The Carnivores," E. R. Ewer, the leading scholar on the subject,has written what I believe is a major insight into the nature of carnivore violence: "Possibly the most striking feature of carnivore social organization is the rarity with which serious fighting appears to be required in ‘maintaining law and order.'" The animals, she explains, respect "ownership," and one carnivore simply passing through does not try to take over from the established owner and in return is rarely challenged, in fact is mostly given free passage. 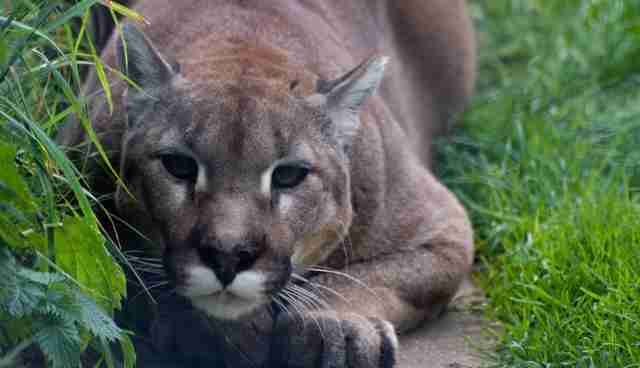 Cougars kill humans, but rarely. Between 1890 and 1989, in theUnited States and Canada, records show a total of 36 attacks, 11 of which resulted in human deaths. Of the 15 cats-all of whom were later killed-a full 80 percent were sick or underweight. A man-eating leopard in India in the 1920s was thought to have killed 125 people. After the Indian army sent a company of Gurkha soldiers to kill the feared "beast" but returned without success, theBritish Parliament asked Jim Corbett, a famed big-cat hunter, to find and kill the leopard. He finally succeeded in 1925. In his book"The Man-Eating Leopard of Rudraprayag," Corbett notes: "Here was only an old leopard, who differed from others of his kind in that his muzzle was grey and his lips lacked whiskers; the best-hated and the most feared animal in all India, whose only crime-not against the laws of nature, but against the laws of man-was that he had shed human blood with no object of terrorizing man, but only in order that he might live." These animals are acting out of character only because they have been traumatized. For a predator to become prey is definitely a trauma, for humans or for other animals. Even then, these other animals act only to satisfy basic needs. Humans are the only species that will act out fantasies putting themselves and others in danger out of pure paranoia. Paranoia is strictly a human condition.It is, when you think about it, extraordinary that we are not prey for most apex predators, including orcas and sperm whales, the largest predator who has ever lived on earth. Richard Wrangham has pointed out that fighting adults of almost all species normally stop at winning: Only humans will fight on, even when there is nothing to be gained by the killing. But are we really "man the hunter," as was believed in the 1960s? Donna Hart, in an article in the Chronicle of Higher Education entitled"Humans as Prey," points out that humans were hardly "the toughest kids on the block" for the vast majority of their time on earth. Quite the contrary-we were more like the 90-pound weakling, she says. She and others believe, and I agree, that an urge to cooperate with one another, even if only to help avoid predators,is built in: "Deadly competition among individuals or nations maybe highly aberrant behavior, not hard-wired survival techniques." There is hope for us after all.